You are invited to consider the job opportunities available at the University of Denver. When you join our faculty and staff, you become part of a dynamic team united by a bold vision: to create a great private University dedicated to the public good. WHY DO YOU WEAR THE SHIELD? The University shield highlights many of the significant aspects of the University, such as history, pride, location, longevity, and a sense of community. The shield represents strength and longevity by encompassing both original and newer buildings. It portrays our stunning location in the Rocky Mountain west, as well as within the city of Denver. The 1864 highlights our founding date and longevity within the local community and worldwide. Above all, the shield represents our strong DU community, which proudly identifies with this key element of our brand. Whether or not they're literally wearing the shield, members of the DU community carry their University of Denver identity with pride. Each member of the DU community has a story about what the University means to him or her, and these many and diverse stories represent the powerful community behind the shield. 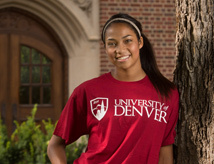 Click here to explore more information about the University of Denver!